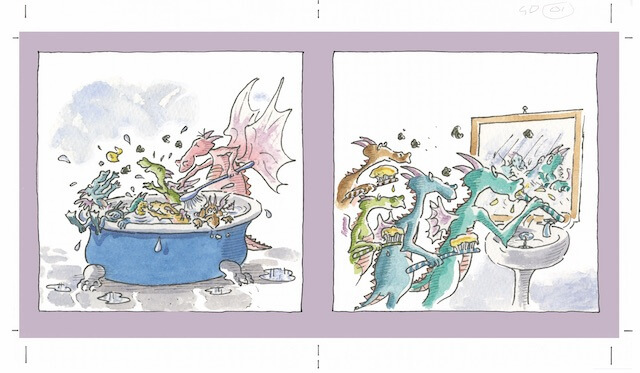 I’ve received a first finished illustration from Peter Utton for our new book within a book – The Book at Bedtime (with Goodnight Dragons). I’m so thrilled with it and really looking forward to seeing the completed artwork. It’s bedtime and Robbie’s absolute favourite book is Goodnight Dragons, so that’s what he asks Dad to read. But somehow the story, together with his excitement over his birthday the next day, become inextricably intertwined… The book will be published later this year in France and Belgium, followed by an expected UK publication sometime next year.